This is the third in a series of posts about water safety. To read the post I wrote right after the accident, click here. To read what I had to say a year and a half later, about what drowning really looks like, click here. hair off like Summer Sanders (which I can’t even find any pictures of, that’s how unfortunate the haircut was–it’s like the Internet has been scrubbed). There’s nothing like starting out middle school with a bad boyish haircut–it just makes that whole awkward time period even better. We had a river running through my backyard growing up and we would hop into inner tubes there and ride through rocky areas and little rapids and deep water until we reached the end of our neighborhood. Without life jackets, which kind of makes me shudder. While I was (and am) scared of a lot of things (heights…enclosed spaces…my parents leaving me in a public place à la Punky Brewster, waterslides), I wasn’t scared of water and, believe it or not, I’m not really scared of water now. After I wrote this post, I received such a wonderful response from so many people–people who shared similar experiences and also people who expressed thanks as well as concern that maybe I’m still a tiny bit neurotic. The truth is that before Clark’s accident and probably until I die, I’ll be a tiny bit neurotic. It’s just who I am. But, strangely, as cautious as I am, water isn’t one of my neuroses, not really–those anxious feelings are rarely triggered by the smell of chlorine or swimming with my kids or visiting a hospital, but they are triggered by the smell of the shampoo I used or certain songs or the feel in the air when the seasons are shifting. Please feel free to psychoanalyze. 🙂 I think part of why I shared our experience in such detail, why I stress again and again the importance of not being blasé around the water, is to express to other parents like me, those who might tend to underestimate the power of water. But my intent was to never make anyone paralyzed with fear. Cautious, yes. Engaged and aware, maybe a little longer than may seem necessary, absolutely. But I didn’t want to freak people out so much that water became their monster, you know? After Clark’s accident, the number one thing we wanted for him regarding the water was to feel empowered. It has taken many hours in the pool, hours in lessons, hours playing, some panicky moments, ups and downs, and it’s a work in progress, but I don’t want him to ever feel like swimming is something he can’t do, because he can. And he does. He has said again and again that he wants to be a swimming teacher and a lifeguard, which makes me unbelievably proud of him. The biggest thing for us has been establishing rules and expectations. Clark is a rule-oriented kid, so this works well for him. They provide structure and a feeling of security, even when he’s in a vulnerable place. What we do may not work for everyone, but I wanted to address some things that have come up, both on my blog posts and through discussions in everyday life. For regular everyday pool swimming, we don’t use life jackets. This is a fairly divisive issue, but I want my kids to learn (and learning includes practicing by playing in the water) to swim without relying on life vests. This means we have a lot of adult supervision and we also have hard and fast rules that absolutely must be followed or pool time is over. Some people have asked when I’ll let my kids have a little more freedom at the pool. I haven’t really discussed this with their swim teacher, but I kind of feel like we’ll know when we’re there and that we’re not there yet. For me, they would have to show both necessary swimming skills as well as good, mature judgment. I think in order for me to send them to, say, a swimming party without me, they would have to have passed the highest level of Red Cross swimming lessons (not necessarily the life saving course because that requires a different set of skills and personality type), which, I hope, would give them the age (early teens), maturity, and skills to keep themselves and others safe in the water. Throughout this experience, I’ve come into contact with some amazing people with similar stories. One of these friends has a story that is eerily similar to ours only, unfortunately, ended in them losing their son. 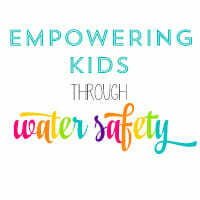 Through the past 18 months, we have become wonderful friends and a few months ago, she mentioned the idea of teaming up with other friends with blogs and water-related stories and using our blogs as a way of sharing water safety ideas during the month of May, which is Water Safety month. 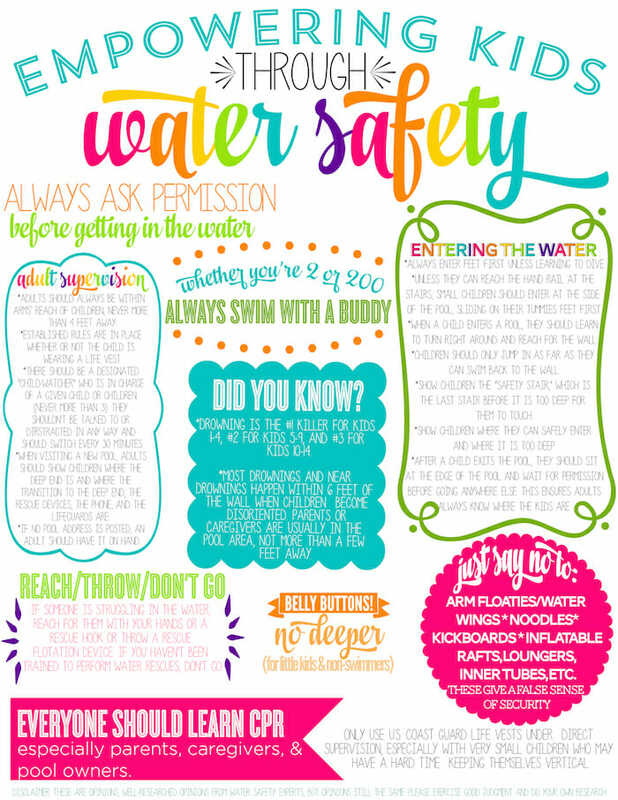 Along with her swim teacher, we compiled a list of water safety tips, which I’ve made into a printable (click here for the .pdf version). Now. We’re not pretending to be the end-all be-alls of the universe when it comes to swim knowledge. And this printable is mostly about pool safety–there’s plenty to be said about water safety around the house as well as outdoors. But, generally speaking, these are tools that will help prevent water-related accidents. There are a few that might seem a little weird, so I want to explain them. The reasoning behind having kids, especially little ones visiting new pools, enter the pool on their tummies rather than the stairs is because when they go down the stairs, they may not fully realize they’re entering a new environment until they’re in too deep. When they enter at the side of the pool, they’re instantly aware that things are different and they’re more likely to be aware and cautious. When I called 911 after Clark’s accident, the dispatcher kept asking for the address and I didn’t know what it was. I kept telling them the name of the hotel, but they kept asking for the address and I didn’t have it. I was so mad about it at the time (like when I was on the phone with them), but we were in a downtown area–what if I had said the wrong Hilton? What if I had the name wrong? There are probably a few Hiltons within a few miles of each other in an urban area, so it would be an an easy mistake to make, but it could have devastating consequences. If you’re visiting a pool, make sure the address is posted and if it’s not, make sure an adult has it handy so if there is an emergency, you can give them the address as quickly as possible. Little kids and non-swimmers shouldn’t play in water deeper than their belly buttons (swim lessons and one-on-one swimming with an adult are different). This gives them enough room to correct themselves if necessary. What we’re hoping is that you’ll share the printable. Not even necessarily the blog post, but we hope that we can get this into the hands of as many parents as possible as we approach the summer months. If you want to, we encourage you to send the file link (or actual fliers) to pediatrician offices, classrooms, gyms, etc.–basically, anywhere with lots of parents. This is probably the last I’ll talk about water safety for the foreseeable future, but I just want to thank you guys so much for all your love and support. It truly means the world to me and I’m so blessed to have such wonderful people in my life, even if I’ve never met most of you! ALSO. If you haven’t snagged our Flavor Variety Gift Pack, you’d better hurry–we only have a handful left! We have two new flavors–rosemary and chili–and they would make amazing Mother’s Day gifts! Thank you so much for this printable! It’s so handy having all that information in the same place. I’m going to share this with my kids’ teachers and hope they’ll give it to the parents! Thanks for sharing your experience/knowledge! In addition to being super helpful and a fantastic idea, your printable is so cute! Thanks for doing this. I pinned the tips to my Pinterest page. Thanks for sharing! These are all fantastic points for water safety! When I was a teen and lifeguarding/teaching swimming, and even now as a mom- I truly wish people would understand the negative aspects of floaties. I still cringe when I see parents not watching as closely because they think their kid will be okay since they are using some sort of floatie. This post really was a great idea, thanks! Thank you for your continued posts on this. After reading all of these through the months/years I saved and splurged on one-on-one personal survival swim training for my 2 year old instead of the group lessons at a pool. Great reminders. I also grew up around water and now that I have two little ones of my own I’ve struggled with how to let water be safe and fun. These rules really do seem to empower kids to safely enjoy the water. I like that both kids and parents have responsibilities when around water. This is awesome, thank you! I will be sure to pass it on too. Thank you for suggesting that we send it on to the pediatrician. I’m going to look up my ped’s email right now and send it along to him. I think I’ll see if I can post it on our school’s facebook page also. Thank you so much for sharing this! Last summer my 3 kids took swimming lessons for the first time – you know, the typical group lesson with a dozen kids and 1 or 2 instructors. After reading your last post on your experience with your son, I decided that – for ME – that just wasn’t safe enough for my kids. I used to be a lifeguard/swim lesson teacher, and the pool near our home is free to area residents this year; so, this summer, my husband and I are going to teach them. We figure a 2:3 ratio is way safer than a 2:12 ratio. Thank you! Neurotic? Maybe, maybe not. Maybe we all are after a close call. I’ll never forget the moment when we realized we had left my 1 year old in the car, in July, in the garage. We had loads of extended family visiting and everyone thought someone else had him. I was busy playing hostess (more concerned about feeding everyone than my 1 year old – Enter extreme guilt!) He’s now a healthy 6′ 15 year old, but just thinking about it still makes my hands sweat, my heartbeat rise, and I want to go hug that child and thank my Heavenly Father, again, for letting me raise him. Neurotic? I don’t care. It’s scarey — and you never forget the terror of the moment. Accidents happen – quickly. I feel for you, deeply. I applaud your efforts to channel those painful memories into something helpful and lifesaving, not only for your son, but for others as well. Thank you for your post! I get so nervous around water with my kids. You gave a lot of good advice and I plan on following it. I never thought of the address.. I was a lifeguard at a very small town YMCA and that was never even a concern. I wonder how many lifeguards don’t even know the address of the pool they are guarding. All other rules are wonderful but I won’t be heading to another pool with my young children without an address on hand. And not in a cell phone! Great post girl! Again, amazing printable! I couldn’t help but laugh about the haircut, I love your quirky sense of humor 🙂 But most of all, I love the content of this post, hope it helps even one family! Thank you so much for this! I have to admit that after your last post, I’ve had chills thinking about this summer and all of our trips to the pool. I’m often taking our three kids (turning 9,6 and 2 this summer) alone, and it’s our favorite thing to do. Empowering them to be safe, while developing a healthy respect for the water is so important. Thanks for the printable! I’ll be starting to go over it with them ad nauseum now. Your last water safety post was such a good reminder. It came at a perfect time. We were faced with the decision, just days later, to watch our kids swim with cousins at a hotel pool or to go have a fun date with tickets I had won. We chose to watch our kids and I have no doubt your good reminder was why. And we knew that with all that family around “watching” that really no one would be watching. And we were so glad we made that choice because our youngest, who just turned 7, had a hard time getting to the side at one point (and with a sister and cousin within reach even). I made my husband read it as well since I am for sure the “neurotic” one. (And we still had that fun date, we were only a little late.) So thank you!!!! I spent last year at the pool with my kids, my 2 youngest never went too far, they liked to stay with me on the stairs, but my oldest daughter who is almost 8, used a kick board every day in the deep end. I feel so dumb. She doesn’t know how to swim. She does not know how to float. It never really occurred to me that something bad could happen if she lets go of the kick board. Your blog, that I found from the sullengers, has made me realize that I know nothing about water safety. I’m getting them all in swim lessons this summer. I’m not getting a pool membership this year. We will play safely In our small inflatable backyard pool until I feel my kids are comfortable in the water and until I know that they could keep their heads above water without a floaty. I never thought of swimming as an important skill but thinking back to the many times I was pushed in the pool by friends, It makes me very scared for my children who can’t swim. Thank you so much, you guys have probably already saved a life. PLEASE don’t feel stupid! There are so many things that you don’t REALLY think about until you look back, you know? I’m so glad you stopped by and I hope you guys love swimming lessons this summer–they’re seriously my kids’ favorite thing about summer! Unreal…thank you for posting this. On Sunday I was standing next to my twins at pool on the stairs of the “big pool” and they had gone back and forth from baby pool… alternating if they had life jackets on or not…I saw my daughter Claire just below the step and she was looking and me and I told my friend “wow…Claire’s swimming…wait…she can’t swim and she doesn’t have her life jacket on”….I stepped down the stairs and she grabbed my arm but there were tons of kids, adults and even a life guard on duty and you would have had no idea she was drowning. It looked like she was treading water…her eyes never went below water but she couldn’t get enough air to yell for help and she was right in front on me …I am for ever greatful for you all who share your stories otherwise I might never have questioned what was happening to her. Thank you!! It’s really nice to see parents involved in water safety. I’m a lifeguard and you would not believe the amount of parents who think it’s okay to leave their 5 year old in the pool by themselves. My favourite water safety saying is “you are your child’s lifeguard.” Really, supervision is necessary any time anyone is around the water. At my pool if you are the only person in the building and you have to get in the pool or do something close to the pool edge, you are supposed to be wearing a lifejacket. Because even experienced swimmers can have accidents (I know an ex-lifeguard who went unconscious from holding his breath too long). So it is okay to be a little neurotic about the water and to really enforce supervision. You aren’t being excessive if you always keep an eye on your family around the water. I noticed you said your son has said he wanted to be a lifeguard. I also had a near drowning experience when I was younger. I forgot I didn’t have my water-wings on and ran straight to the deep end at a neighbour’s barbecue. My mother didn’t pull me out of swimming lessons and I don’t remember if she was really nervous of me being around the water or not but I think continuing to swim probably made the experience less traumatizing. So I think you’re doing the right thing by making sure to be aware of the dangers of water but not letting the experience ruin swimming for you or your son! My parents were really supportive of all the lifeguarding courses I took and it probably ended up being a really big part of why I became a lifeguard because when I failed one of the courses and was ready to quit, they pushed me to repeat the course. If you’re interested, the Life Saving Society (I live in Ontario, and the LSS does all of our lifeguarding qualifications and lifesaving courses. They also have a set of swimming lessons but I find the red cross’s swim program is better for swim strokes.) has a Water Smart program. (Education key: http://www.lifesaving.org/download/Water%20Smart%20Education_Key%20Messages_2010.pdf) We do a Water Smart week at all our outdoor pools during the summer which raises funds for drowning prevention and teaches kids about water safety. You could check around with your local pools or even just shoot the LSS an e-mail about getting involved in the program. We just bought a new house in November so this will be our first summer with a pool. Excited, but want to make sure we take the proper precautions. Is there any way you can repost the safety tips? I was not able to access the PDF…Thanks! Hi, Donna! I’ve fixed the link, so you should be able to access it now. Thanks for the heads up! Your information is right on. Please check out and add info from Infant Swimming Resource / http://www.infantswim.com. Infant and toddle survival swim lessons are an essential layer of protection to add to the list you have compiled. Thanks for posting this, Kate. It really made me think about when I take my kids to the pool and how prepared I really am/would be to help them. I just read about secondary drowning, and that is scary, too! I am grateful, though, to be educated about these things to hopefully prevent them. Thanks again for your hearts for water safety. I love the water safety printable, but it is really tricky to read the ‘grey’ font color. Is there any way you could send it to me so I can edit the font color, or you could change the grey to black? Super info for all parents and caregivers!! A brilliant resource for PE teachers. Thank you. I am struggling to print it and find the grey problematic. Thank you for the beautifully done poster! I am a certified lifeguard and own and operate Vero Beach Swim School in Vero Beach, Fl. I love what you have put together and will be giving it out to my summer camp students!